Learn how to make orange cheesecake recipes. These creamy desserts with the vanilla filling remind me of those orange Dream Sickle ice cream bars from years ago. They still might be on the market but when I was young, I loved the great flavor. They had just the right blend of orange with the vanilla cream ice cream. For many years living in Florida we all tried to learn how to make orange cheesecake recipes (and all kinds of orange recipes) to utilize the abundance of Florida oranges. It seemed everyone in Florida has many trees growing on their property. You couldn’t drive down a road without seeing these beautiful trees; especially at harvest time. Oh, the smell of all the orange blossoms! The people who owned all the orange trees were so generous to us; we had an endless supply of this wonderful fruit. Key limes and lemons were also a plentiful citrus; pies, cookies and key lime cheesecakes and lemon cheesecakes were always popular to makeas well as the orange cheesecake recipes. Orange problems hit Florida! First came the cold freezes which destroyed so many groves. Then came the citrus canker; this was devastating to the farmers. Many of the groves and trees in our back yards had to be destroyed. Then large developers began purchasing the groves to build homes on the land. After a few years of problems like these many more farmers began selling off and moved their operations to other countries. The beautiful landscape of perfect orange groves became barren or laden with “look-a-like houses. It became hard to get Florida oranges for our recipes. Still everyone learned how to make orange cheesecake recipes because by them it became more of a tradition. Over the years we all collected many delicious orange recipes which we continue to use. This is one of the few orange cheesecake recipes which is inverted after chilling making it an upside down cheesecake recipe. Soften gelatin in orange juice; add sugar and stir over low heat until dissolved. Chill gelatin mixture until slightly thickened. Arrange orange sections in bottom of 9 inch spring form pan. Pour gelatin mixture over orange sections and chill until thickened but not set. Soften gelatin in orange juice; stir over low heat until dissolved. Combine cream cheese, sugar and peel; mix on medium speed until well blended. Gradually add gelatin mixture mixing until blended; chill until slightly thickened. Fold whipped cream into gelatin mixture and pour over mixture in pan; chill. Combine crumbs, cinnamon and butter; gently press onto top of cake and chill. When totally set loosen cake from sides of pan and invert onto platter. Combine cookie crumbs and melted butter; press firmly and half way up sides of 9 inch spring form pan. Beat cream cheese in large mixing bowl until fluffy; gradually beat in sweetened milk until smooth. Add pumpkin, eggs, liqueur, pumpkin spice and salt; blend and pour into prepared crust. Bake 1 hour and 15 minutes or until cake springs back when lightly touched. Cool to room temperature and then chill; serve with whipped cream. Some orange cheesecake recipes get added flavor from ingredients like orange marmalade. Combine flour, 1/3 cup sugar and ¼ teaspoon grated orange peel. Add egg yolk and 2 teaspoons orange juice stirring with a fork until dry ingredients are moistened. Press mixture on bottom and 1 ½ inches up sides of 10 inch spring form pan. Bake 10 minutes and remove from oven; set aside to cool. Beat cream cheese on medium speed until fluffy; gradually add 1 ¾ cups sugar beating well. Stir in sour cream, remaining 1 teaspoon orange peel and 1 teaspoon orange juice. Remove from oven and run knife around edge to release sides. Return to oven, turn oven OFF and leave door partially opened; leave in oven 30 minutes longer. Remove cheesecake from oven and let on rack to cool completely; cover and chill 8 hours or more. Melt marmalade in saucepan over low heat; cool. Spoon over cheesecake and arrange orange sections on top. 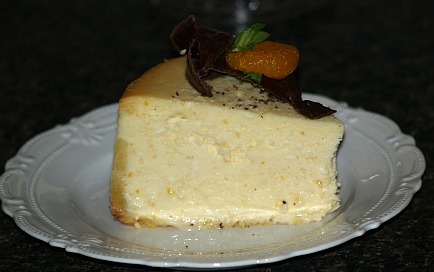 Some of the orange cheesecake recipes have a stronger orange flavor than others. This one has more orange peel and orange juice adding to the flavor. For crust combine flour, sugar and rind; cut in butter until crumbly. Add egg yolk and vanilla; blend well. Pat 1/3 of dough into bottom of 9 inch spring form pan. Bake for 5 minutes or until golden brown; remove from oven and cool. Pat remaining dough evenly around sides of pan to ½ inch from top. To make filling combine cheese, sugar, flour, orange rind, salt and vanilla in large mixing bowl. Beat cheese mixture on low until smooth. Add eggs and egg yolks one at a time beating well after each addition; stir in orange juice and Grand Marnier. Pour orange cheese mixture into prepared pan with crust. (Baked only on the bottom). Place aluminum foil on oven rack under pan; bake at 400F degrees for 8 to 10 minutes. REDUCE HEAT TO 225F degrees; leave cake in oven to bake another 1 hour and 20 minutes. Remove from oven and let cool to room temperature; refrigerate for 8 hours or overnight. Serve garnished with Mandarin orange segments, chocolate curls and mint sprigs. Preheat oven to 325F degrees; butter bottom and sides of 9 inch spring form pan. TO MAKE CRUST blend crumbs, butter and sugar; press in bottom and sides of pan. TO MAKE FILLING blend together the sugar, salt, flour and cream cheese. Add vanilla, liqueur and peel to the cheese mixture; add YOLKS and mix well. Blend the heavy cream into the cheese mixture. Beat egg WHITES until stiff; fold into the cheese mixture. Pour mixture on top of crust; bake for 1 ¼ hours; TURN OVEN OFF. Crack the oven door slightly; leave cheesecake in oven for 1 hour. Remove from oven; cool completely and refrigerate until cold. FOR TOPPING spread top with pie filling before serving. TO MAKE CRUST combine and blend crust ingredients. Press ingredients firmly on bottom of 10 inch spring form pan. Bake crust for 8 minutes; set on rack to cool. TO MAKE FILLING drain mandarin oranges RESERVING ½ cup of the liquid. Combine the oranges and liqueur; stir gently and set aside. In large mixing bowl combine cream cheese, orange rind and flavorings. Beat on high speed of mixer until fluffy; gradually add sugar beating well. Pour filling into prepared crust; bake 50 minutes or until center is almost set. TURN OVEN OFF and open door slightly; let cake set in oven for 30 minutes. Remove cake from oven to cooling rack; cool to room temperature. Refrigerate cheesecake for at least 8 hours. TO MAKE TOPPING drain the liqueur from the oranges reserving liqueur. 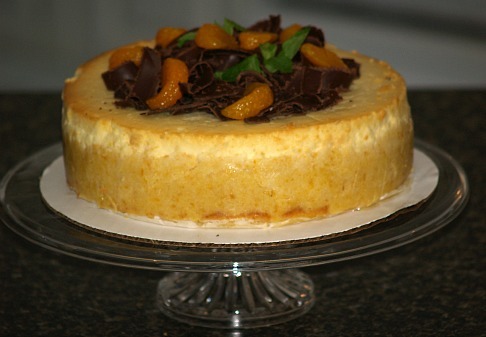 Arrange the mandarin oranges on top of cheesecake; set aside. Combine reserved mandarin orange juice and reserved liqueur in saucepan. Add to pan the orange juice and cornstarch; stir to blend. Cook over medium heat 5 minutes or until thickened; cool slightly. Cool slightly; spoon glaze over top of cheesecake and chill.